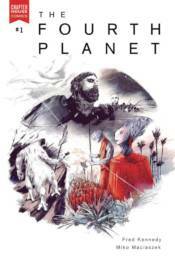 The Fourth Planet is the brand new series from Chapterhouse Comics that The Examiner called 'evocative and truly cosmic.' The quarterly, written by Fred Kennedy and brilliantly illustrated by Miko Maciaszek, sets the stage where a stolen warship loaded with runaway human slaves crashes onto a planet with three warring races, the most advanced of which has only just begun using gunpowder weaponry. Vastly outnumbered, will the humans become the very thing they were running away from? The warship Lightstorm has crashed on an alien planet. Even though its occupants seek only survival, they become unwillingly entangled within the constant warring of the planet's native species.